Thank you, from the bottom of my heart, for your kind messages, articles and prayers. I know that many of you are hurting, and I am truly touched not only by your memorial tributes for George, but also that you reached out to me personally. 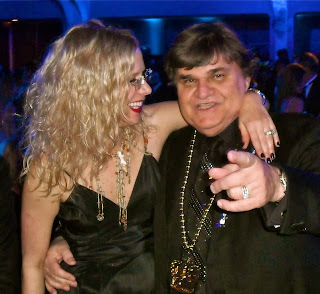 I also thank you for your generous donations to the George Rodrigue Foundation of the Arts. 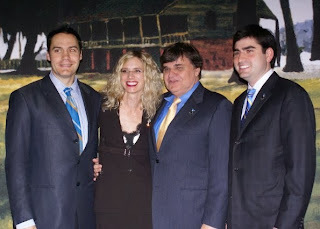 Our family is more determined than ever to continue its educational and scholarship programs. 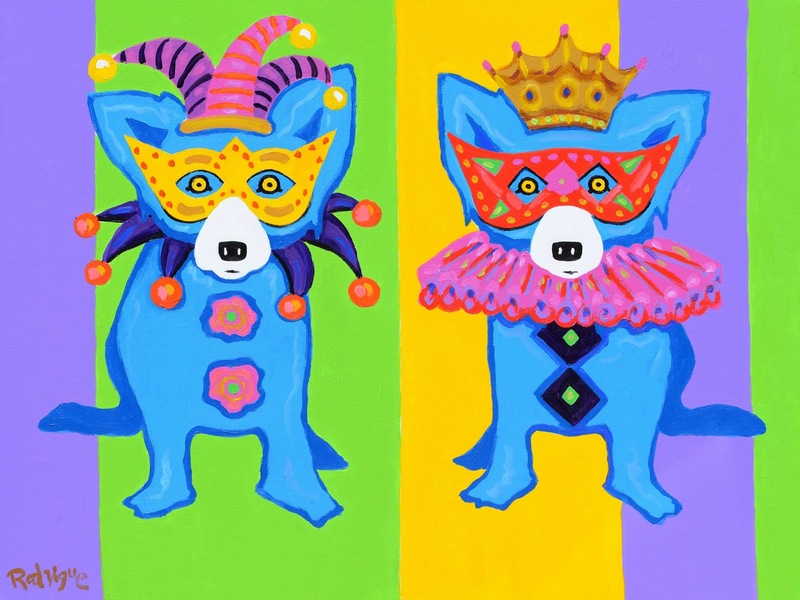 George Rodrigue’s three galleries will reopen this month, beginning with New Orleans on January 16, 2014, followed soon after by Lafayette and Carmel. Our remarkable, dedicated staff remains intact and, in the midst of their own grief, ready to resume work, sharing George’s art and life with others. We will begin with exhibitions devoted to George’s history, including photographs, articles, and original artwork from our home, his studio, and his archives. In addition, we’ll present throughout the coming year several new silkscreen prints, beginning with artwork designed by George in 2013 for this purpose. George’s younger son, Jacques Rodrigue, energized by his youth and his dedication to his dad’s legacy, assumes full-time gallery management, even as he continues his leadership within the George Rodrigue Foundation of the Arts and Louisiana A+ Schools. In addition, George’s facebook page remains active thanks to Jacques and his team. George’s older son, André Rodrigue, remains in Lafayette at Jolie’s Louisiana Bistro and the Blue Dog Café, where most days you’ll find him relaying history at his increasingly crowded table, or making seafood wontons in the kitchen, both with equal diligence and importance, and both imbued with his natural spirit of kindness and generosity towards friends and strangers alike. And me? I’ll remain involved peripherally for now, advising quietly as needed, while otherwise allowing these capable young men to lead the galleries and foundation in new directions. I know that they, as much as me, remain, above all else, mindful of the awesome responsibility of their father’s legacy. At the top of this letter, I thanked you for your messages. However, I must be honest. On my computer sits more than one thousand unread emails. My telephone voicemail is full. The newspaper and magazine articles remain unread. And your cards and packages sit unopened, stacked high in our foyer. I know that they are there. I know that you are there. But I can’t face any of it at this time. Please know that I will return to the telephone and mail on the days when I most need to hear your voice and read your words. And in the meantime, I'm comforted just knowing that your messages await. I hope you’ll forgive me not only for the confession above, but also because I must retreat from the public life and, to a great degree, from our private lives, for now. To those of you who might worry, please know that I am not alone, and that I will be Somewhere. Take care of yourselves. Take care of your loved ones. Peace, strength and courage to you all. Your post brought tears to my eyes. Thank you do much for thinking of us this difficult time. May God comfort and bless you. Writing and sharing this was such a selfless act and exhibits why George loved "his Wendy". I treasure even more the two Blue Dogs I own and know that you will find peace and comfort as time passes. How lucky you were to be an intimate part of such an amazing person's life! We will all be here for you. Now, and when you are ready to blog again. Thank you for the excellent news that the galleries will remain open. Whenever my husband and I come down to Nola from Shreveport, we always make a point to go George's gallery! Take care of yourself, rest and heal. The first time I followed the blue paw prints around the sidewalk and up the stairs to George's Blue Dog show in Manhattan I started to smile. I have followed George's career and the your loving blogs. Even though they must have been painful, these blogs of your love of George, his triumphs and illness for all of his followers has been an inspiration. Farewell for now, sweet Wendy. You will be missed ,thought of, and most of all, loved. praying for you and all those who loved George. I've never met any of you, but treasure a print I have and have read your blogs for years. i pray that memories of your love sustain you and turn the sadness to joy. Wendy - George's final words brought tears to my eyes. George's work brought so much joy to so many people. I feel privileged to own a piece of his legacy which I can gaze at and enjoy all the way across the Pond in London. Blue Dog will live on. I am so sorry for your loss. I want you to know that you and George are very special. I will miss George. It's clear to see that Mr. Rodrigue had two muses in his life...one was Tiffany...the other you...I will miss seeing & talking with both you at book signings & public appearances & especially seeing new projects by Mr. Rodrigue. God bless you & keep you & God bless you too Mr. Rodrgue !! I am truly sorry for your loss. I was hoping that one day I would meet my cousin. 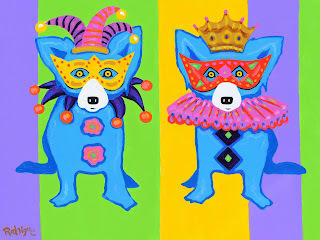 I have always enjoyed the Blue Dog but when my aunt linked the you family Rodrigue and ours.....well it made it a little more then special. I always said I would get down there to meet you all but the military has kept me busy. Our thoughts and prayers are with you and your loved ones. I have always been a fan of your husbands work. I found this page while looking for one of his paintings. I am so sorry for you and and your family's loss. Thank you for sharing George with us all he has touched so many people's lives. Sending prayers and hope . Dearest Wendy, Tearfully, I repeat, "Farewell for now." I wish you peace and solace in the coming months and years. I have your book and hopefully will gain the courage to read it sometime soon. I have many of George's books and count my treasure. It is wonderful to see Blue Dog on Facebook! Thank you. I visited the NOLA gallery on Good Friday. I was filled with such mixed powerful emotions. And at that moment looking at the wedding invitation painting of you and George, I realized I not only miss him and his work but I miss you and your writings also. I hope that someday you will once again share your writings with us. For now, I wish you peace for the journey that you are now on and that one day your pain will become less and be overshadowed by happy memories and love. I wanted you to know that I was thinking of you. You were kind enough to reply to a Facebook message I posted on your page last August. That meant a lot to me and I thank you for your kind and thoughtful words. I wish, now, that I had the words to comfort you, to take away the ache, to say something so poignant it could lift you from the sadness, even if temporarily. I'm stymied, however, by the limits (my limits) of language. That said, I send you warmth, joy, peace. If we are truly all connected, then this message, whether you read it or not, will reach you in some way, as with all the other messages of love from friends and strangers, alike. And may my thoughts combine with others and George's ongoing spirit to surround you with love and joy. Hi Tracy- Thank you for your kind thoughts and well wishes. I agree- we are all connected, and I have no doubt that your message of love will reach Wendy.